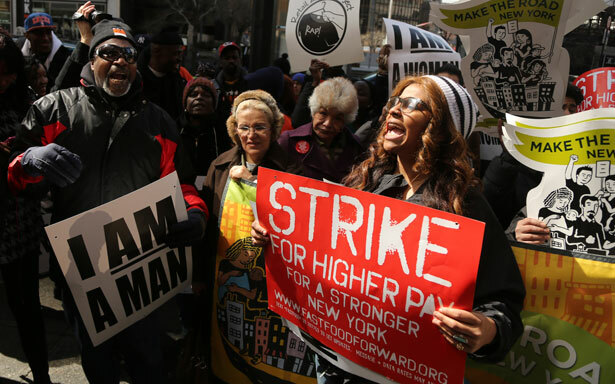 The campaign for higher wages in the fast food industry goes global. The yellow arches of McDonald’s have always symbolized a dubious kind of globalization: worlds apart bridged by the tentacles of multinational corporations, spawning enormous profits for a few, and Big Macs for all. The arches may have a different symbolic power now that they’ve sparked a global movement for living wages and the right to unionize. On Thursday, in an expected 230 cities spread across six continents, workers from McDonald’s and other fast-food chains rallied together to demand wages of $15 an hour and to protest their working conditions. Demonstrations were planned from Casablanca to Belfast, Santo Domingo to Venice, Bangkok to Auckland and across the US. Low-wage work isn’t TV—it’s reality, and an impossible one, for millions of people. On Thursday, I talked to several of them about their reasons for striking. Though DeFife may be unable to hear them, the truth is that many fast-food workers simply can’t afford to be silent. “I can’t afford anything. I’m working forty hours a week to still struggle,” said Dominiik Allison, a Wendy’s employee who joined a rain-soaked rally in Chicago on Thursday. Allison is 31, and he’s raising a 12-year-old son and a 1-year-old daughter by himself. He described life as an endless series of irresolvable choices. “Do I sacrifice food in order to make sure my kids get back and forth to school and daycare? Should I not eat for this week so that a bill can get paid? Should I not have a cellphone this month so that I can provide the necessary pampers and clothes for my 1-year-old?” He’s looking for a second job, but isn’t sure how he’ll manage the time. Robert Taylor, another fast-food worker with two kids, had to quit his job at a Chicago McDonald’s for several months late last year because he couldn’t afford to pay for transportation and for someone to watch his children while he worked. He picked up his old job again in April, at $7.75 an hour; his first paycheck, he said, was about $144. A hundred dollars went to an electricity bill. After getting back and forth from work, the remaining $44 was gone, too. “So where does that leave me to buy pampers and wipes and a Happy Meal? I can’t even afford to buy my kids nothing at the job I work at. I can’t even buy them an ice cream in the summertime because I don’t have enough money. Do you know what I’m saying? I’m not even making enough money to buy ice cream,” Taylor said. Last week, Taylor was counting on working the twenty-two hours he’d been allotted on the schedule. But he said the manager kept sending him home early, and in the end he was paid for less than eighteen hours. Besides the low pay, it’s practices like having his hours cut and being treated “as though you were less than a person” that pushed Taylor to protest. It’s not just $15 an hour he wants, but the ability to fight for better treatment without repercussions. Edgar said he’s a straight-A student, with a particular interest in politics and history. His dream is to study law. “I would like to continue my education but it’s really hard for me to provide for my daughter and continue going to school at the same time. It’s really expensive as well,” he said. For Oscar, a Wendy’s employee in Miami, the protests are about basic fairness. “A lot of fast-food workers in this country and other countries, we work really hard, and we need an increase,” he said. He helps to support his mother and his sisters, and he sends money to his grandparents in Nicaragua. “I would like to say to my mom, ‘Mom, don’t worry. I’m going to pay everything for you.’ But I can’t,” he said.